Are you having trouble getting your little ones to enjoy their veggies? Or maybe your kid is already a veggie monster, but you’re running out of ideas? Here’s our roundup of our favorite kid-friendly salad recipes filled with yummy, hearty ingredients. The best part? Kids love to help make the salads, mixing their favorite colors and flavors together. Click ahead and start exploring these easy-to-make veggie-packed salads! My two little boys are the exception, it seems, to what I thought about kids. They readily eat their veggies, many different varieties. Green, yellow, orange, it doesn't matter. Raw or cooked. They definitely did not get this from me. Are you having trouble getting your little ones to enjoy their veggies? Or maybe your kid is already a veggie monster, but you're running out of ideas? 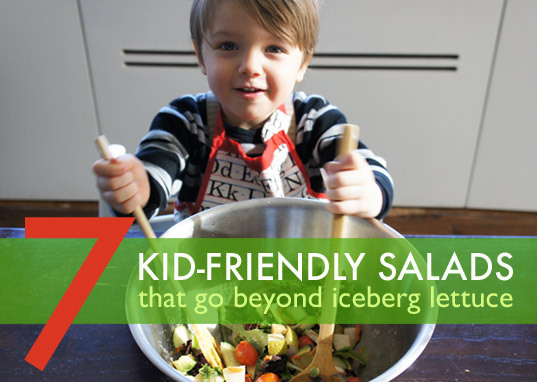 Here's our roundup of our favorite kid-friendly salad recipes filled with yummy, hearty ingredients. The best part? Kids love to help make the salads, mixing their favorite colors and flavors together. Click ahead and start exploring these easy-to-make veggie-packed salads!